Carapichaima East Secondary’s Dexter Neils,right, is challenge by Fatima’s Saeed Pompy Charles for the ball as the two teams met yesterday, at Fatima Grounds,Mucurapo. 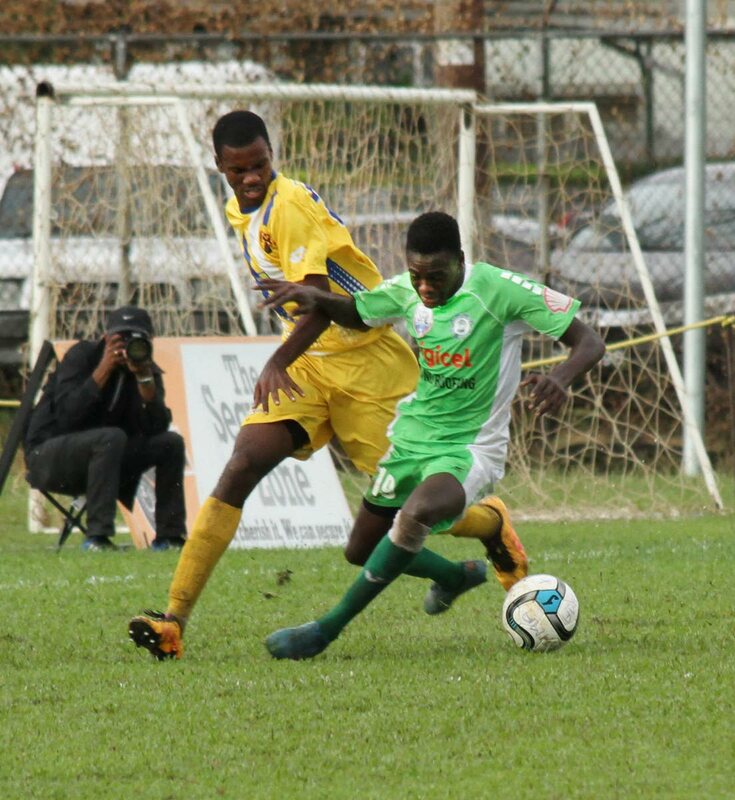 SAN JUAN and Naparima remain unbeaten after yesterday’s slate of matches in Round 10 of the Secondary Schools Football League (SSFL) Premier Division. San Juan joined leaders Presentation San Fernando on 25 points after a narrow 1-0 win over QRC at Bourg Mulatresse, Santa Cruz. Captain Renaldo Boyce scored in the first half to guide San Juan to their eighth victory in nine matches. However, Presentation San Fernando, who were on a bye yesterday, remain top of the 15-team standings, by virtue of a superior goal difference. Naparima stayed in third spot after a 1-1 draw at home to Valencia at Lewis Street, San Fernando. Naps have a tally of 22 points from 10 games. Trinity East climbed three spots to fourth after whipping table-proppers Bishop’s High 2-0 at Tobago, while Trinity Moka edged St Anthony’s 3-2 at Westmoorings. Keon Boney netted a double as St Benedict’s defeated East Mucurapo 2-0 at Guaracara Park, Pointe-a-Pierre and Fatima registered their second win of the season when they edged Carapichaima 2-1 at the Fatima ground, Mucurapo. The scheduled encounter between St Augustine and St Mary’s was postponed due to a waterlogged outfield at St Augustine. Round 11 action will be contested on Saturday. Reply to "San Juan, Naps remain unbeaten in SSFL"